Create a beautiful world for your loved ones by sending this Enjoy the Christmas Attractive Gift Hamper wrapped up in the essence of your love and warm feelings. 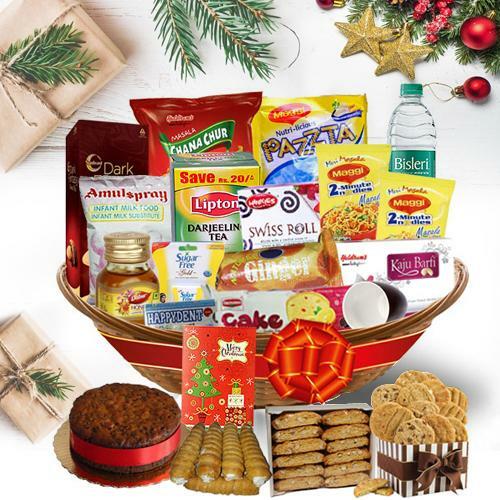 This Hamper is presented with a Christmas American Fruit Cake, a Box of Dark Fantasy Biscuit, a Bottle of Honey, a Britannia Fruit Cake, a Container of Sugar Free, a Christmas Card, a Pack of Kookie Jar Ginger Biscuit, a Packet of Biscoti, a Box of Green Tea Bags, Kaju Barfi from Haldiram, 2 Packets of Ready to Eat Pasta, a Packet of Happydent, 200gm of Haldiram Chanachur, a Packet of Cream Rolls, a Box of Swiss Rolls, a Packet of Amulspray Milk, 2 Cupcakes, 2 Packets of Maggi and 1 Water Bottle in a Cane Basket. Flowers Delivery Jalna, Send sweets Jammu, Wedding Cake Srinagar, Diwali Mithai Warangal, Send Flowers and Gifts to Kozhikhode, Online Shop Udipi, Flower to Churu, New Year Flowers Bhusawal , Fresh Fruits Bareilly, Send Gift Durgapur, Dry Fruits to Delhi, Birthday Delivery Khanna, Sending to Cochin, Flower shop Nagaur, Sikar Online Cake Delivery.